The Cane Corso is a mastiff type dog, but without the very loose skin typical of mastiffs in general. The advantage to this is that it drools less. Cane Corsos are also smaller than regular mastiffs. Cane Corsos' ears are surgically cropped for aesthetic reasons. The Cane Corso originated in Sicily, Italy. Cane Corsos range from 22-28 inches (56-71 cm.) in height. A Cane Corso might weigh in the 80-140 pounds (36-63.5 kg.) range. 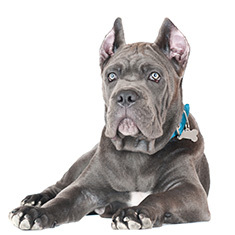 Cane Corsos may be black, black & tan, tan & fawn, red, chocolate or brindle. The Cane Corso's short thick coat requires minimal care and only occasional brushing. Cane Corsos are light shedders. Originally used for herding and guarding, the Cane Corso is somewhat aggressive with strangers and other dogs and is only recommended for an experienced handler. Cane Corsos make excellent family dogs, as they are quiet, loyal, intelligent and gentle with children. Cane Corsos make excellent guard and watchdogs and are very willing to please their families. 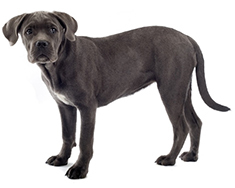 Cane Corsos are prone to bone and joint problems. A Cane Corso can be expected to live about 10-11 years. Cane Corsos are active dogs and require regular exercise. They make excellent jogging partners. Cane Corsos are happy to live outdoors provided they have shelter. The Cane Corso dog breed is not recognized by the AKC. Find Cane Corso Puppies with our Free Breeder search!